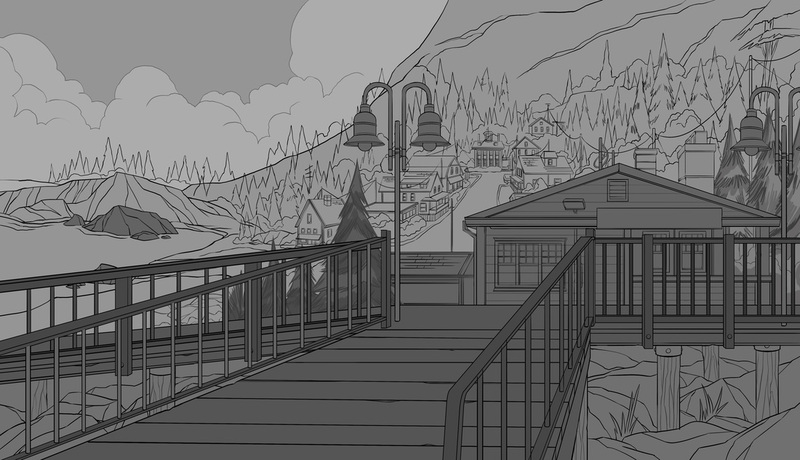 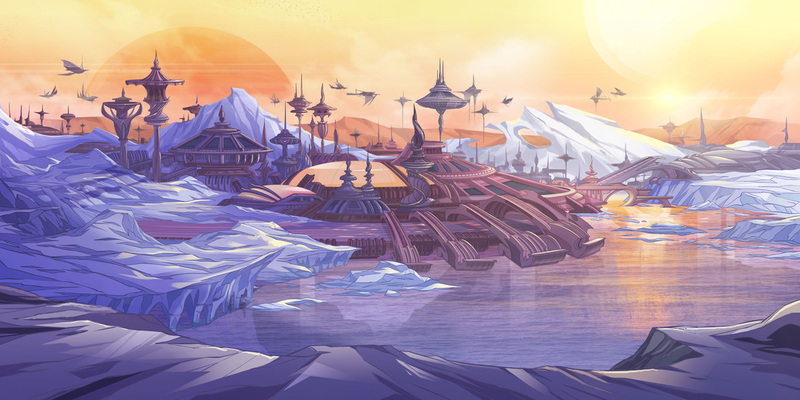 The environments of Everstar are designed to give us more information about Ainslie (if we are looking for it), and mirror the evolution that she is going through as her world is cracked open from a small town in Maine to the outer reaches of the celestial frontier. 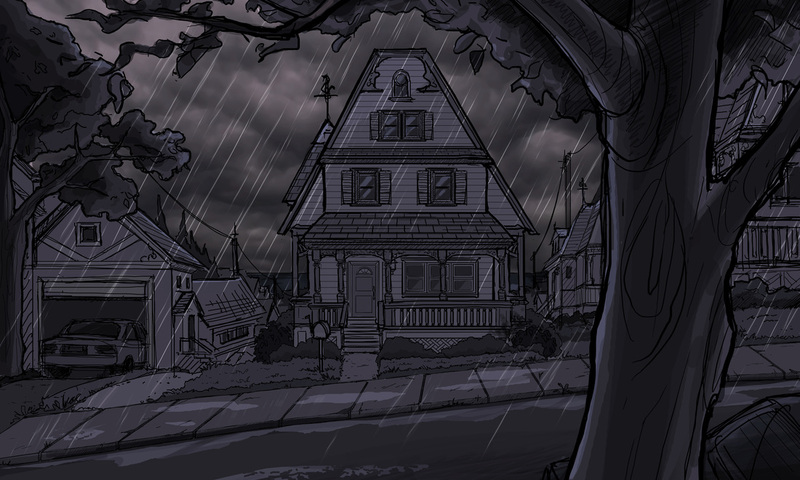 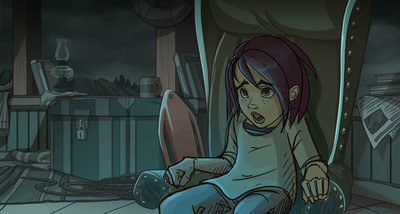 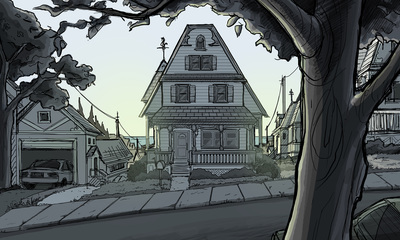 EARTH Locations - When we first meet Ainslie, we are introduced to a girl who is too colorful for her surroundings. 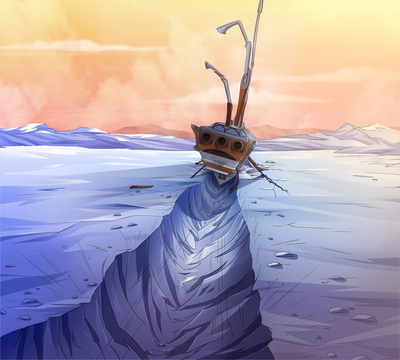 She is constantly testing her limits and seeking adventure at any cost. 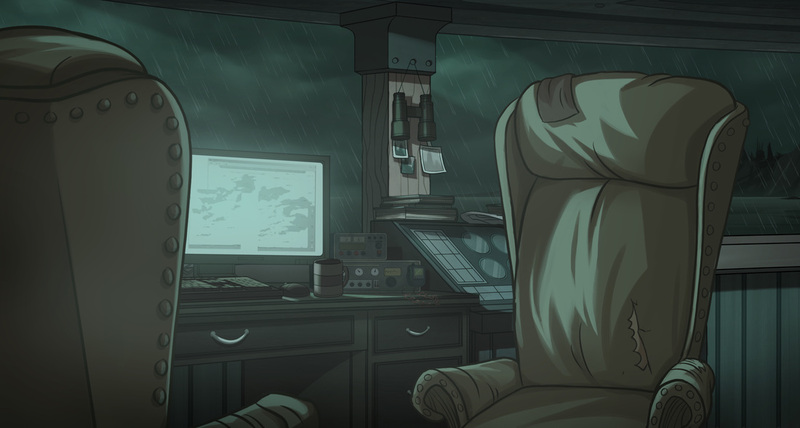 It is for this reason that we are first introduced to her as a shock of color (her little boat, the S.S. Drake), on vast, dark, dangerous waters in the middle of a storm. 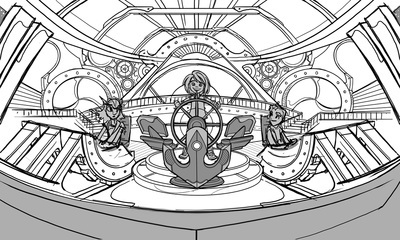 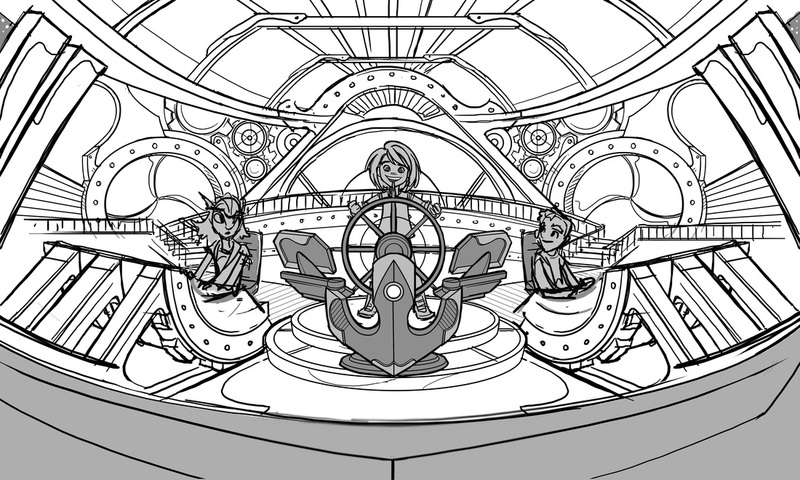 This will foreshadow her future ship, the plucky Everstar, in the vastness of outerspace. 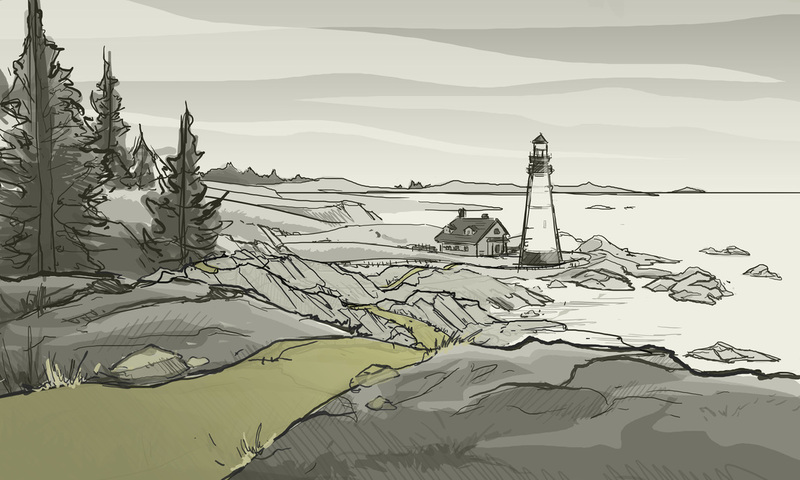 The environments on earth are devoid of intense color, but pigment builds as Ainslie slowly approaches the freedom and adventure she so desires. 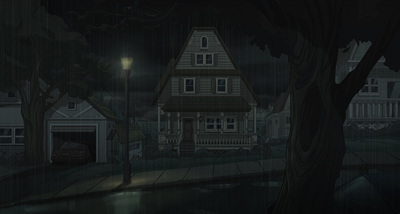 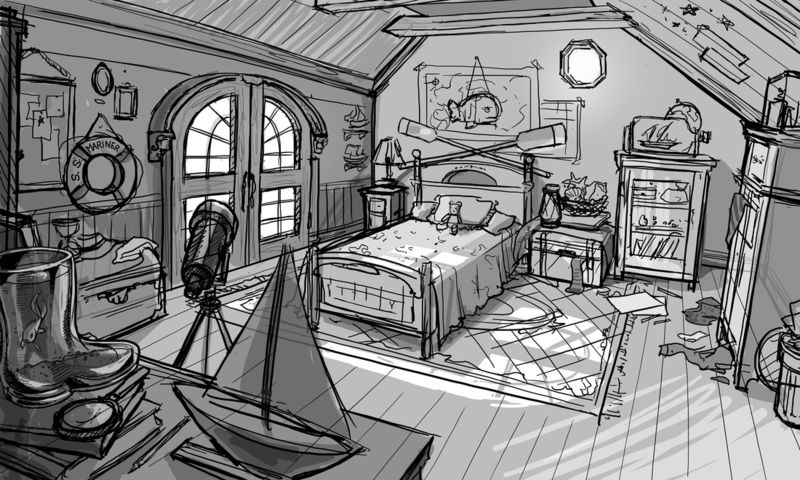 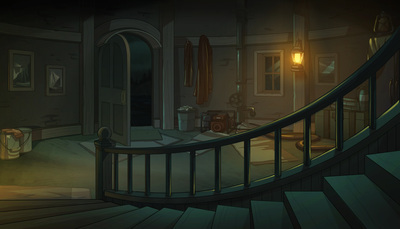 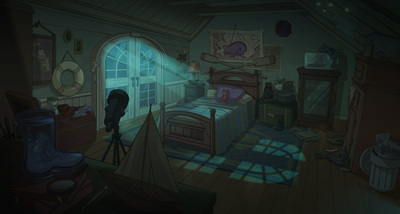 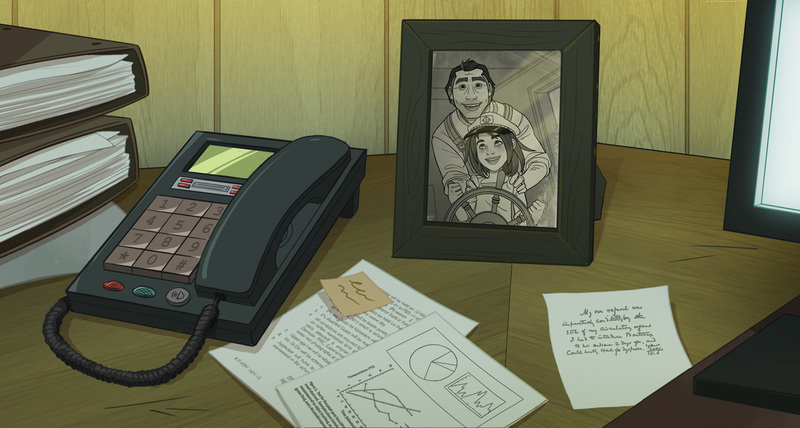 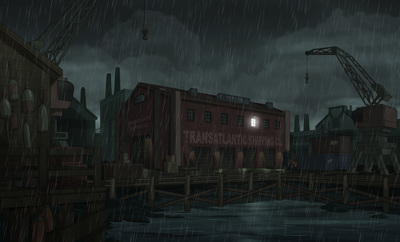 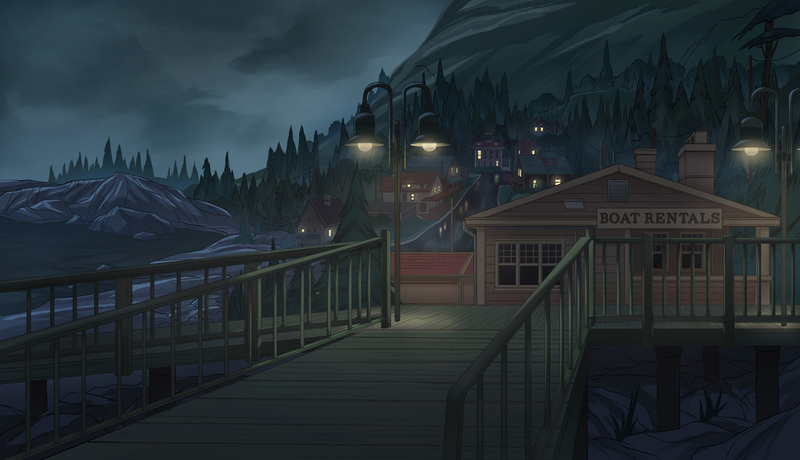 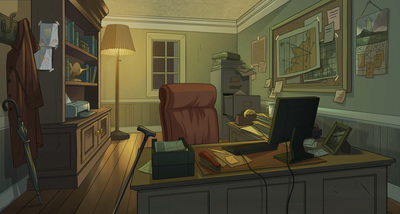 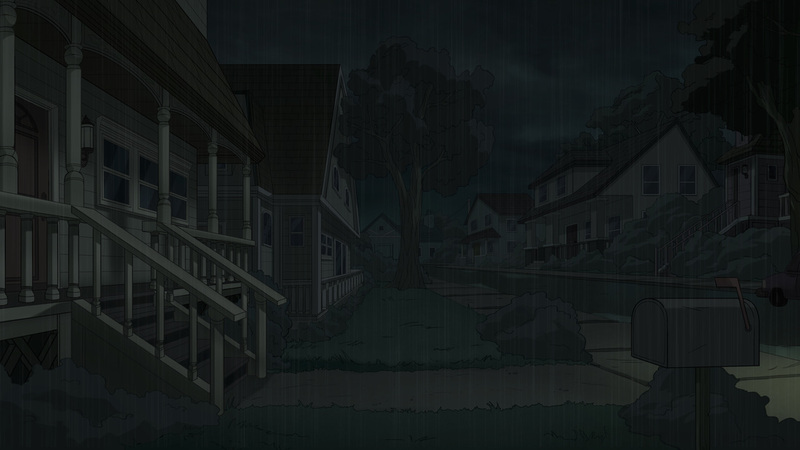 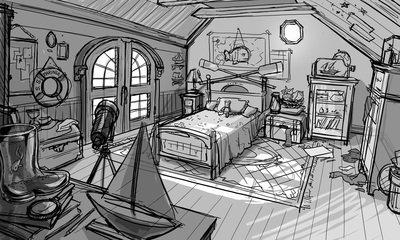 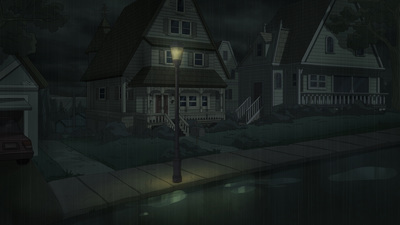 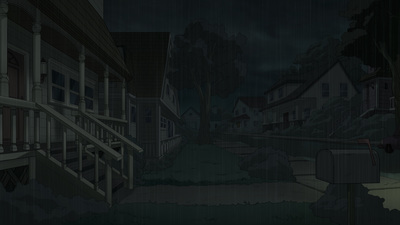 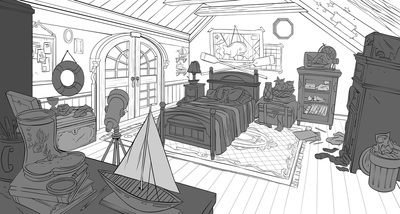 Points of illumination placed in the backgrounds are a nod to her following her 'true path' (the lamp posts at Carroway Harbor, the lighthouse on the cliff, the lanterns in the lighthouse interior, the street light outside of her home.) 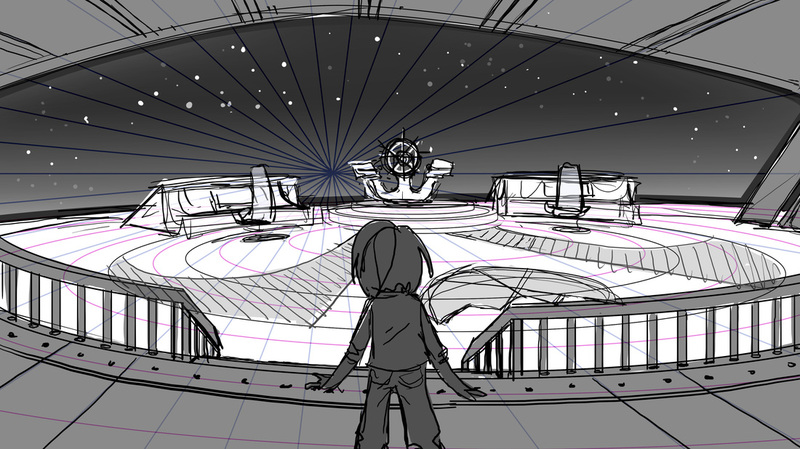 The final light was situated at a crucial spot for our protagonist. 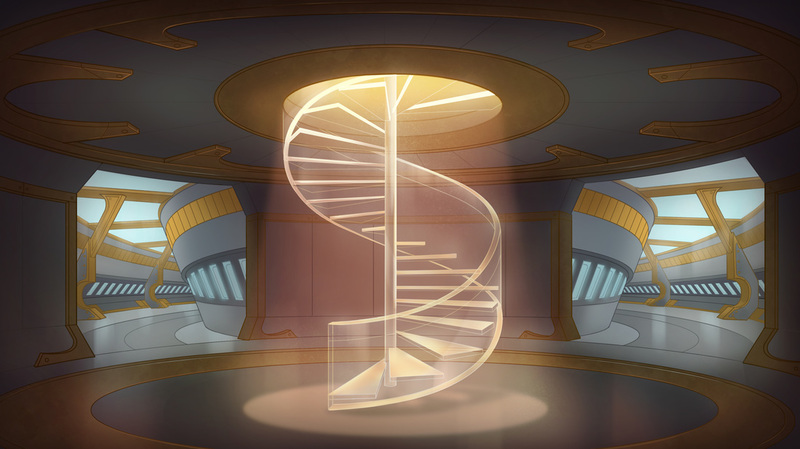 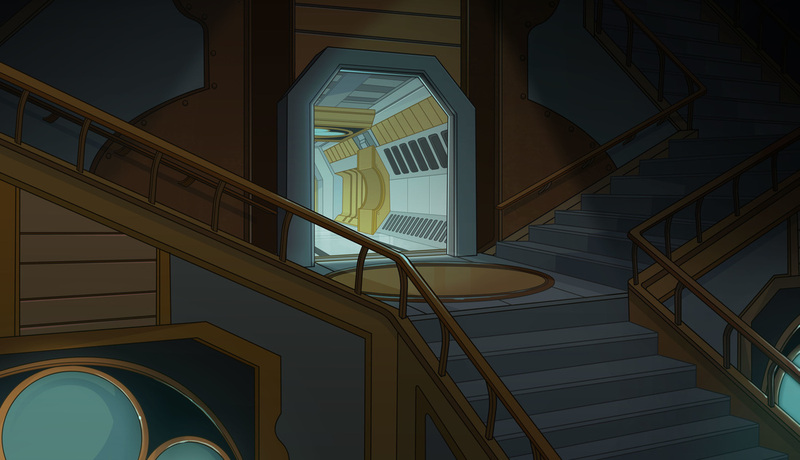 It is both the literal doorstep of her comforts at home and the doorway to her new adventures on the Everstar. Fittingly, Ainslie and George are brought aboard in a burst of light. OUTERSPACE Locations - Once Ainslie and George are on the ship, the shapes and colors they are surrounded by take on a decidedly different tone. The colors are more vibrant, and the Everstar ship has a steam punk meets space travel feel. 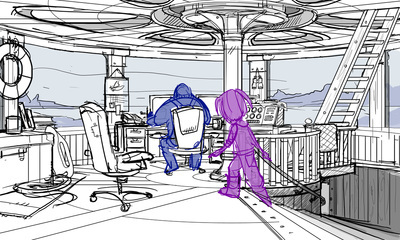 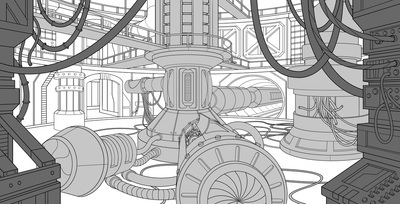 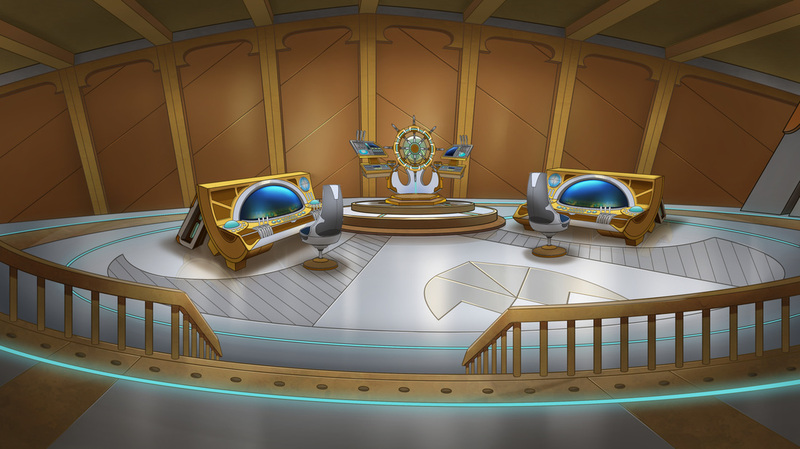 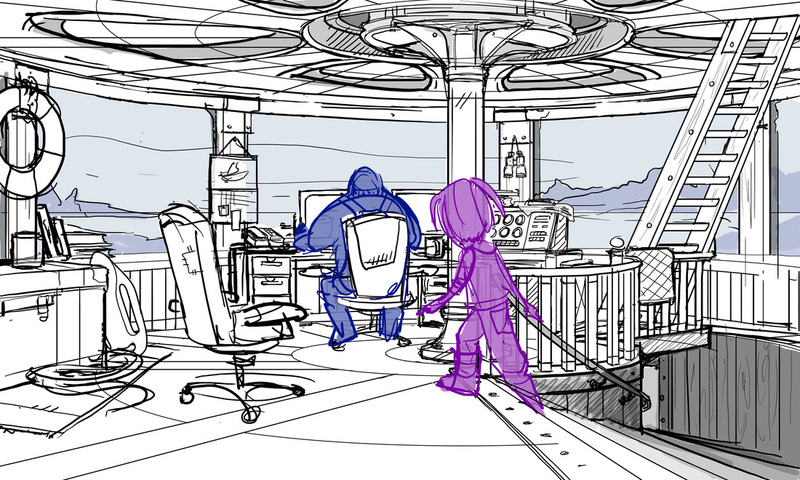 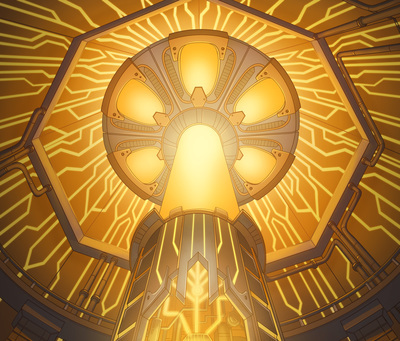 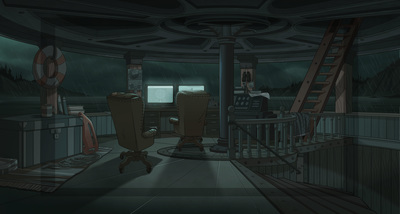 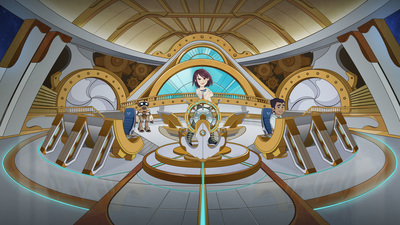 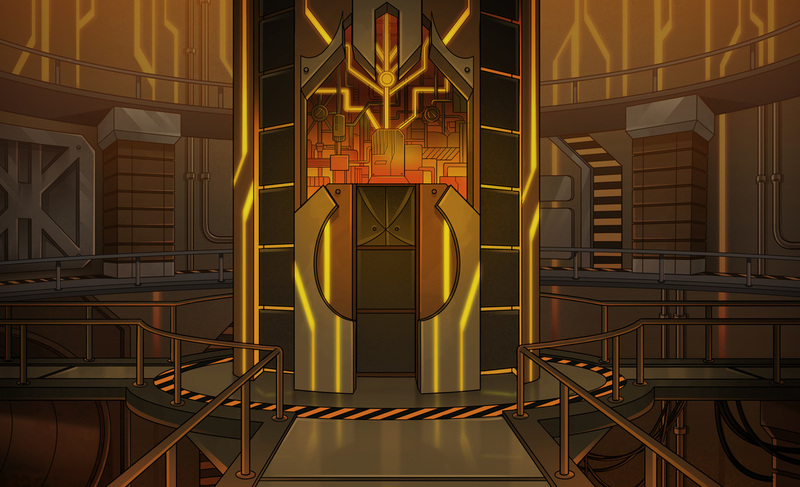 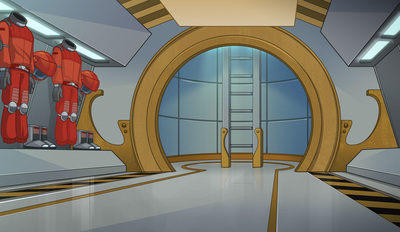 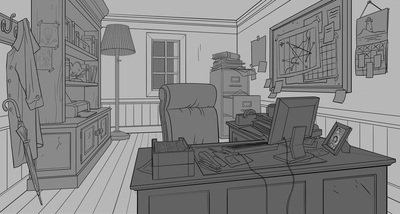 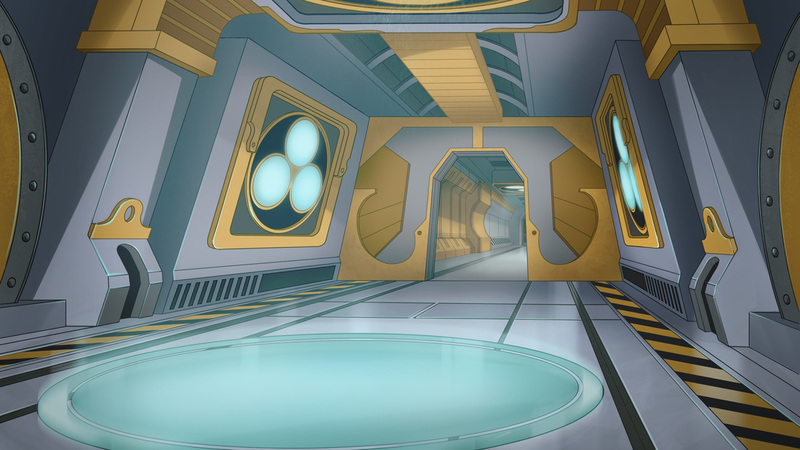 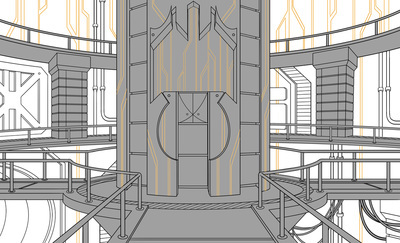 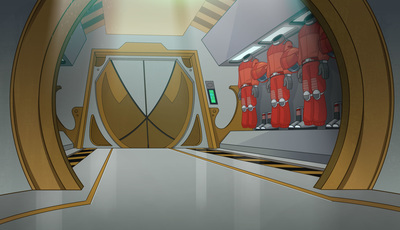 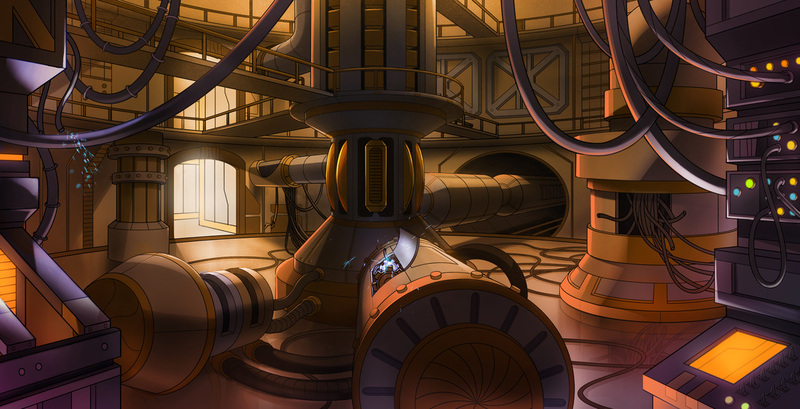 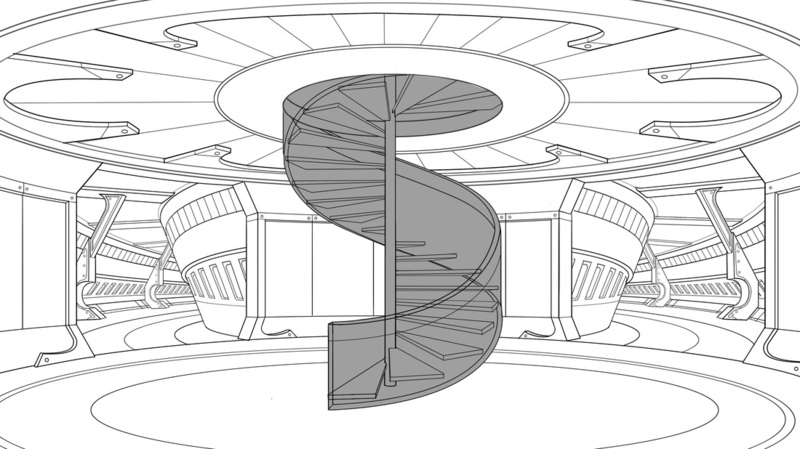 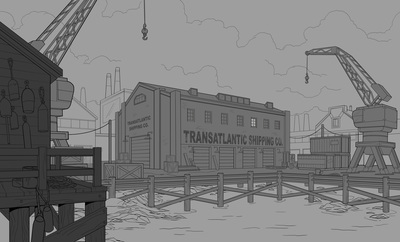 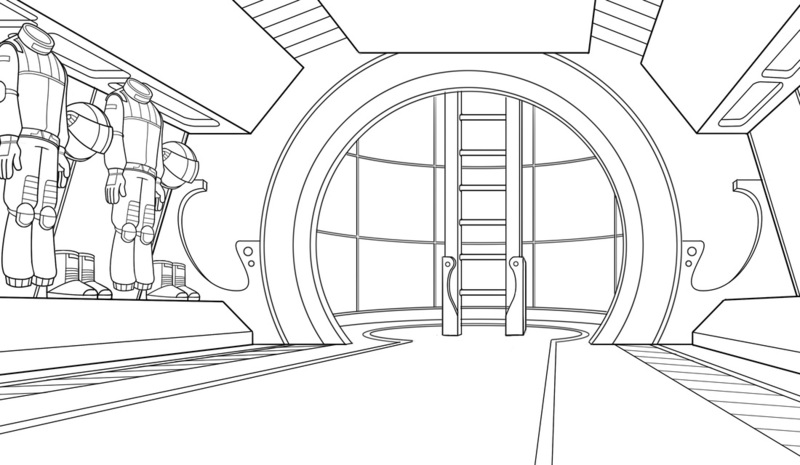 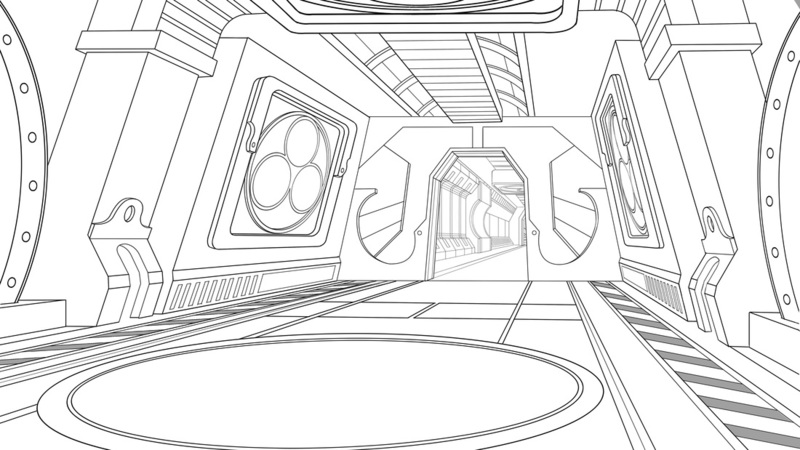 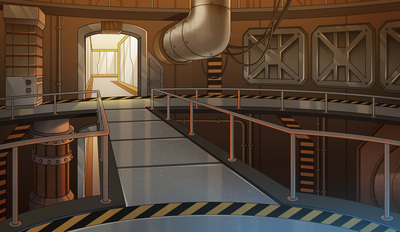 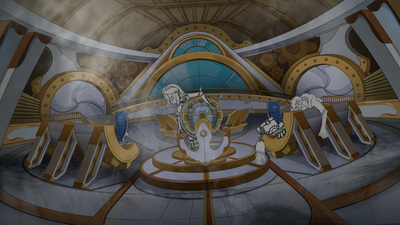 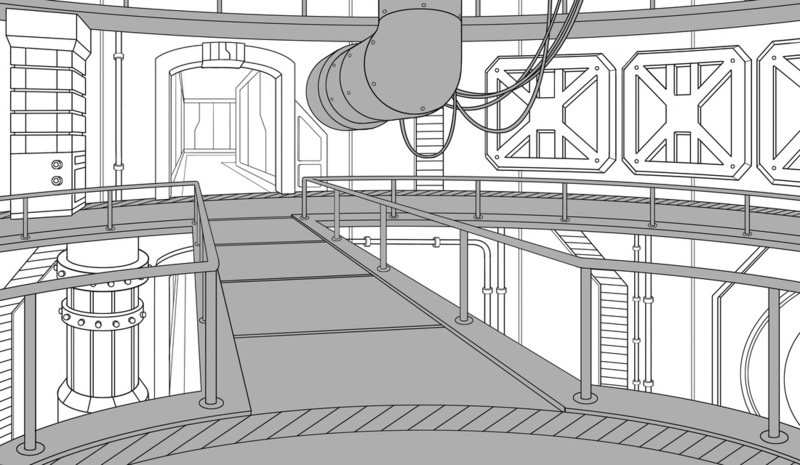 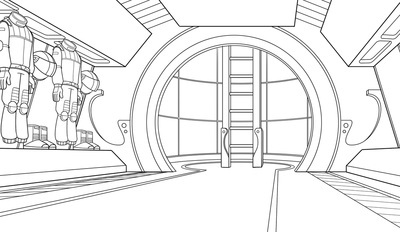 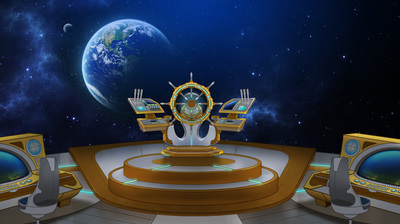 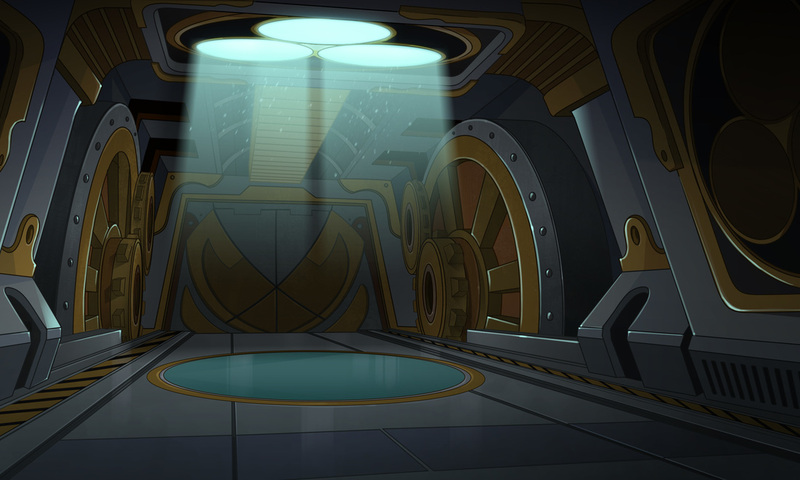 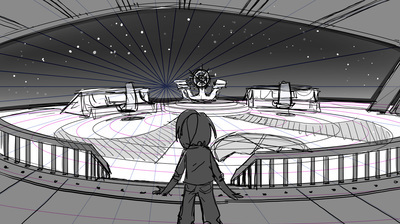 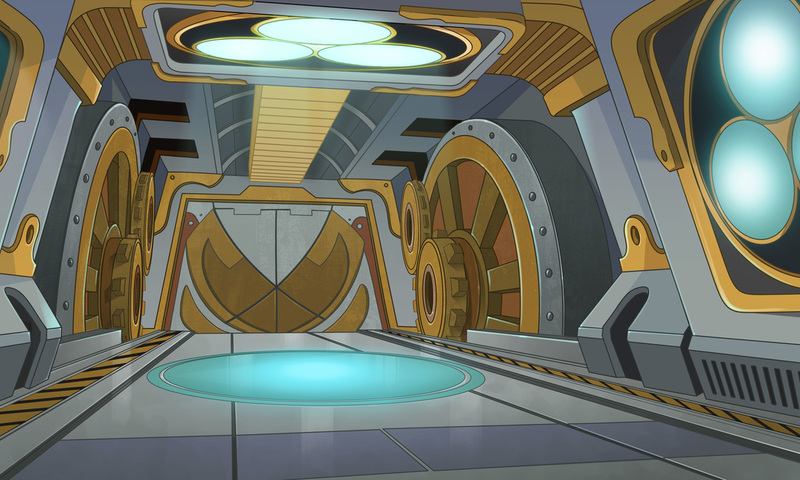 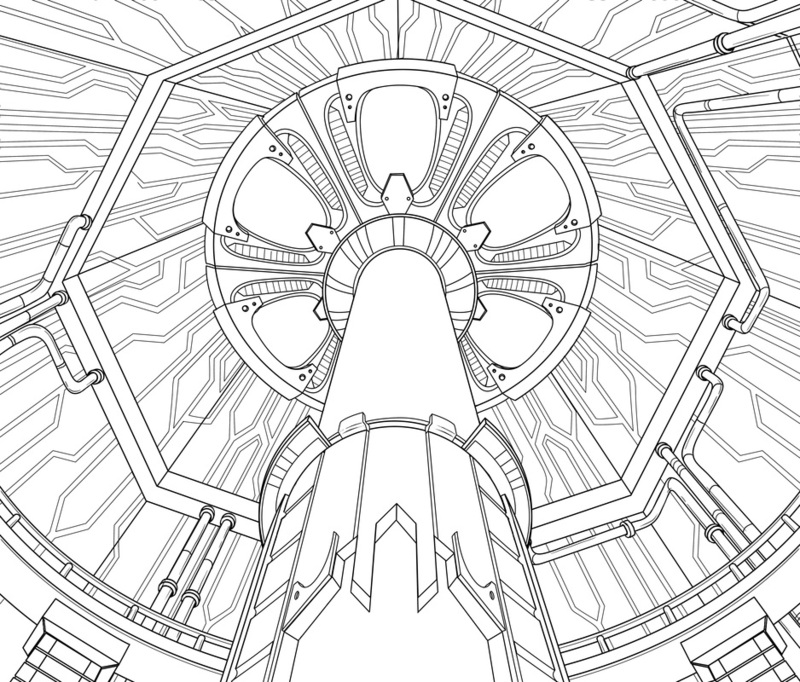 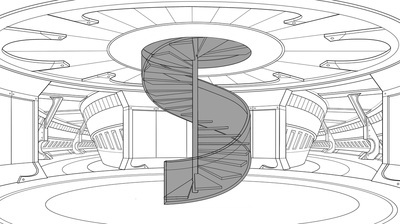 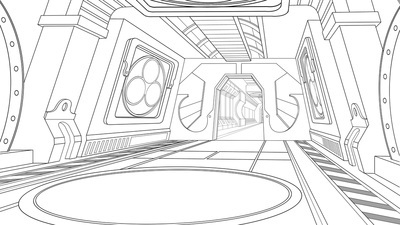 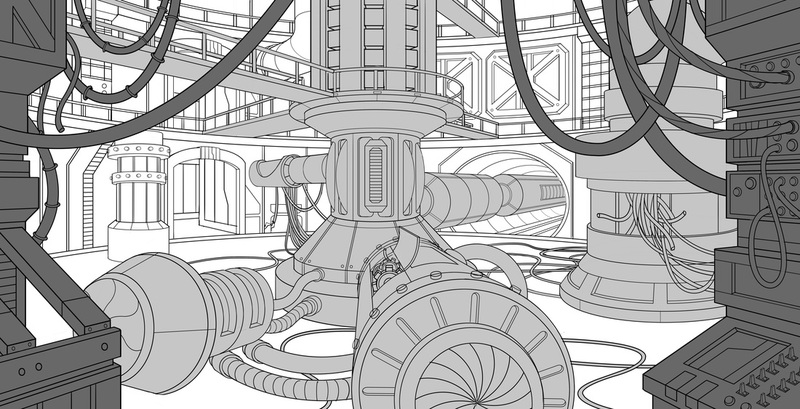 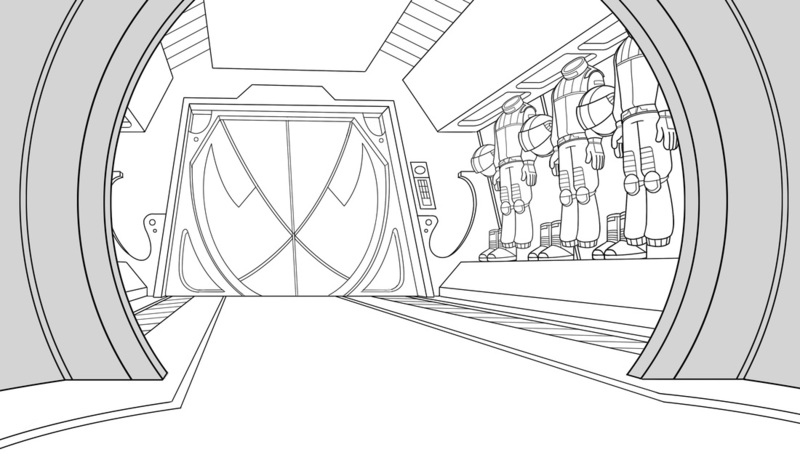 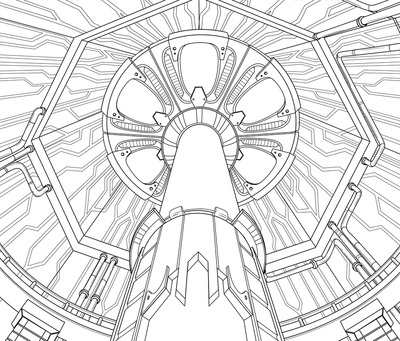 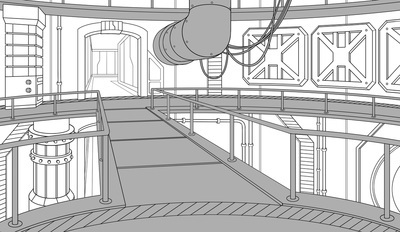 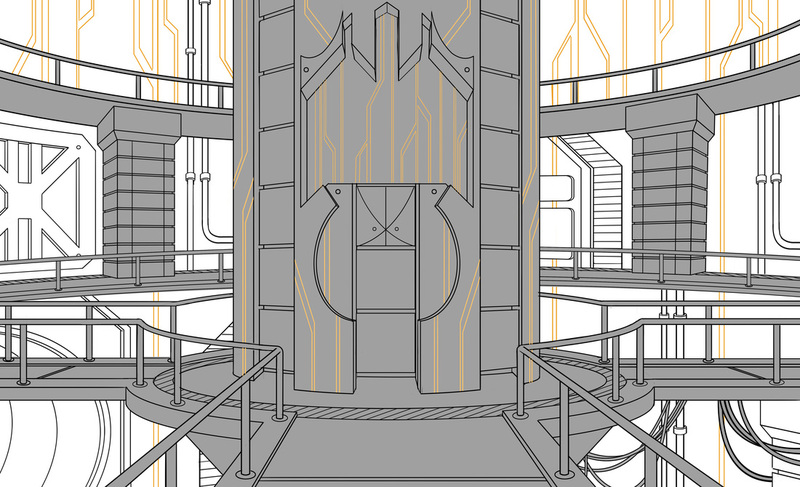 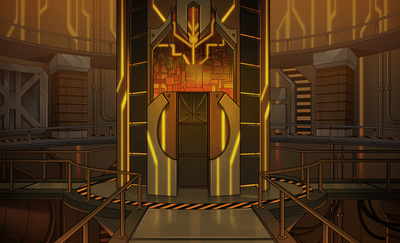 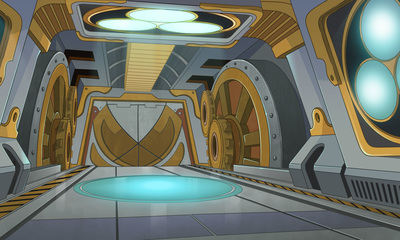 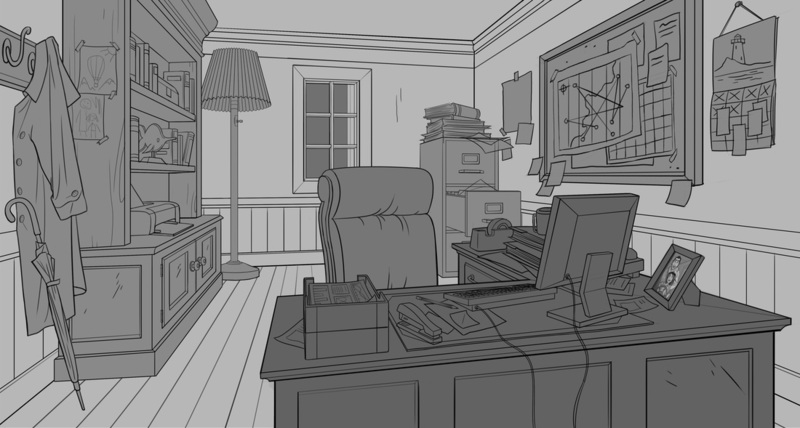 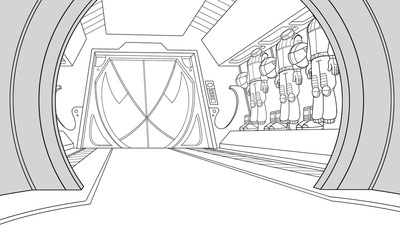 Every environment on the ship builds to the brightest background design and climax of Episode 1 - planet Iriway. Even though Ainslie and George have essentially doomed themselves to wander the far reaches of space with no guarantee of getting home, Iriway should still feel inspiring and hopeful. 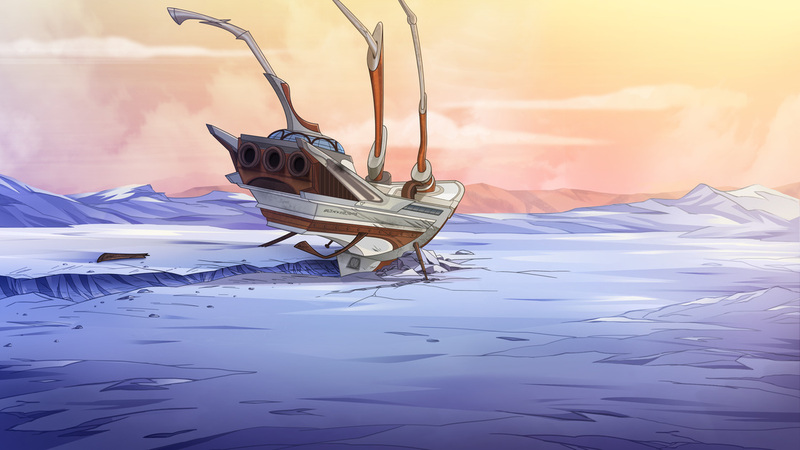 The unknown and the alien can be scary, but it can also be beautiful. The bright colors and curving organic shapes of Iriway are meant to encourage Ainslie and George (and our viewers) to press on and explore more.